Representing innocence, the elegance of white roses sparks gentle memories and comfort, making them a favorite gift to offer a gift of sympathy. Good: One Dozen (12) White Roses (50 cm). Better: Eighteen (18) White Roses (50 cm). Best: Thirty-Six (36) White Roses (50 cm). In Loving Memory Funeral Banner. Rest In Peace Funeral Banner. Standard (Good) Arrangement Measures 19" H x 15" W.
White Rose Bouquet is a hand delivered gift. These gifts are delivered by one of our local design centers located throughout the United States and Canada. Same day delivery is available for most gifts when ordered before the cutoff time. 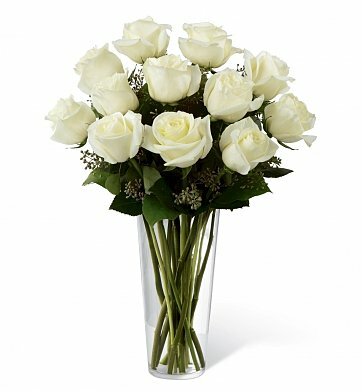 The cutoff time for White Rose Bouquet is 2 PM in the recipient's time zone.